Sage is a 15-year-old orphan in a small Carthyan city. He’s got a reputation for mischievousness, not to mention pickpocketing and general thievery, but generally he tries to fly under the radar. That is until a minor noble, Bevin Conner, plucks him (along with three other boys) out of the mire and decides that one of them will be the one to put his Grand Plan in motion. What is that Grand Plan, you say? Well, it turns out that someone has murdered the entire royal family, except for the prince — Jaron — who was killed by pirates four years before. What Conner wants to do is train these boys up and the put one of them on the throne as the False Prince: a puppet to fool the regency just long enough for Conner to be named the grand regent, and essentially take over. Bottom line: if you haven’t read The Thief (or didn’t like it all that much — I’m thinking of C here; she tried and just didn’t like it), then this one will be new and surprising and exciting. I haven't read the The Thief, but now I'm intrigued because I've heard lots of good things about The False Prince. 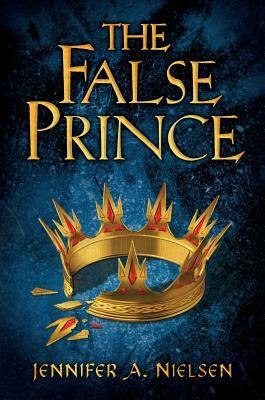 So, I think what I'll do is read The False Prince first, and then The Thief. 🙂 Thanks for the review!